I pick up at the point where my husband went to his first ever interview since deciding to leave his job of many, many years. He had been injured that very morning, but went ahead with the interview, and did NOT get the job. Bummer, but we figured it was not meant to be. In August we took a big family vacation to Maine. It was truly a time of refreshment for our family, and also the time we sat our kids down and told them what was up. We had a time of honest sharing and praying over the whole situation. I asked Jeff what HE would really like to pursue as a future job, not taking into account wages, benefits, etc. Topping his list was anything involving wood, a longtime passion of his (when we had free time, which was not very often). Other then that he had no one thing that he was honed in on trying. Post-vacation, Jeff went back to work, but with a very clear sense that he no longer belonged there. Before we knew it, the holiday season was again upon us, historically their company’s craziest time of year. In the back of our minds was always the question of “what in the world is going to happen to us after this?” However, working oodles of hours doesn’t allow one to complete a job search very well. I watched my husband working himself to death, trying to do a good job and making sure the company was well prepared for his leaving. He would leave super early in the morning, come home maybe by dinnertime, and be sound asleep by 7 pm every night. He was working like a madman and I was feeling like a single parent. Well, Christmas soon came and I nervously wrote out our situation in our Christmas card letter, asking folks to lift up our family in prayer. At this point he hadn’t applied or sent a resume anywhere else yet, and I started to get very nervous. On January 2, the kids went back to school, but Jeff had a day off. He had by then compiled a list of possible places to apply and I helped him sharpen his resume. Many of them had no job openings listed, but he took a chance and sent or dropped off a resume anyhow. For the place at the very top of his list, he physically stopped in to drop off a resume. The owner of the company, who often travels, happened to be there and ended up giving my husband about an hour-long tour of their facilities and talking with him. The owner told him they had no openings, but they were thinking about maybe hiring someone else. He took his resume and Jeff came home wound up, excited about this particular place. About two weeks passed and we had no leads, other than one other place that was maybe interested in him. At this point he had already given his company a final date, even though there was not a new job lined up. I remember one day I was feeling incredibly anxious about the whole thing, having no idea what our future held. I was lifting the whole thing up to God, and had a clear comfort from Him: “My daughter, don’t you fret. Trust me. I’ve got this.” Immediately I had a calm that can only be attributed to coming from Him. I laid my trust in Him and recognized that His plan would be revealed in the right time. In mid-January, Jeff had an unused week of vacation time from the previous year to use or lose. He used it to keep on the job hunt, still not having much luck. That same week he got a call from the wood place he was most interested in. Could he come in for an interview that week? Sure! He went in for the interview and was offered a position that very same day. (Of course, he said he would consult with his wife first before making a decision.) I really felt like he should go for it, and it was set that he would start in February. He went immediately from one job to the other, without any period of unemployment, so that was a huge praise. Well, that’s the long-winded back story on how my husband decided to leave his career and start completely fresh somewhere else. Thank you to those who have prayed for us these many months. I give God the glory for lining things up the way only He could do, and we are completely trusting Him for whatever the future may hold. I have shared approximately zero about this topic on my blog yet, but today’s the day. Those who know us personally know that our family (well, my husband specifically, but it affects us all!) has undergone a big life change in 2017. My dear man, back in mid-February, chose to leave his career of nearly 28 years. Jeff has been a butcher all of his adult life, and for the same company too. He had learned and mastered many different roles within the company and enjoyed his work. It was where we had both envisioned him working until retirement. Back in 2015 he lost a finger–ironically, not at work, but at home on a lawnmower belt. At that time the surgeon informed him he was not to work for 6-8 weeks, as the risk of infection was too great to be handling raw meat and other such things. So, very unexpectedly, my husband was off for a good portion of a summer. At the time, though it was a complete bummer that he was now minus a finger and temporarily out of work and a paycheck, it wasn’t the end of the world, could have been much worse, and I had the strong sense that it happened for a reason. Why, we had no idea, but I really felt like when that happened it was a catalyst for a change of some kind. He went back to work with gusto at summer’s end and things were basically back to normal. At the end of 2015, after a very stressful holiday season with many long hours, one night he was nearly crying and told me “I can’t go through another holiday season there.” We felt a change coming but had no idea what that was yet, so we just prayed about what that may look like in the next year. He trudged through the beginning of 2016 and worked as normal. I felt the call to begin working part-time and got a job as secretary at our home church. One evening in July, Jeff was feverishly working on something on the computer. I could see the frustration etched on his face and asked what he was working on. “A resume” was all the response I got. Though I knew this was likely coming, I was still a bit in shock. He had seen an ad for a wood distribution place that he apparently was interested in and planned to send a resume to. We both slept little that night, tossing and turning and praying. He sent it in and got a call for an interview the next week. The morning of the interview he went to work early, before anyone else was in yet. As he was pulling out a rolling metal cart out of the smokehouse, it tipped over and landed on top of him, about 1,000 pounds between the cart and the meat on it. I was later sickened when I heard that a metal bar or pipe was firmly lodged right on his windpipe. Miraculously he was somehow able to wiggle out with just some burns on his face and neck, bumps and bruises, and a sore back. (I was also a little ticked that he didn’t tell his wife until late that afternoon!) The poor guy went to a job interview with a bandaged face and neck, a missing finger, and limping badly from his ordeal that morning. He didn’t get the job…. Refuge. That word has been rolling around in my mind for the last several days. It keeps popping up in my thoughts and, though I have not blogged in awhile, I knew I had to write about it. Here’s what got me started…. This building in the picture. St. Paul’s Chapel, New York City, NY. My daughter and I took a bus trip to NYC this past weekend. We visited a lot of the main tourist spots you would likely think of—Brooklyn Bridge, Times Square, Central Park, and so on. But this place, St. Paul’s Chapel, was one of my favorites. I have no explanation why, other than it felt like a place of refuge to me. It was used as a refuge for many on the day of 9/11, plus for rescue workers in the many months following that tragic day. It was used as a center for rest, meals, sanitation, etcetera round the clock. Entering it for the first time almost 16 years later, I could see why it felt like a refuge. For myself and my daughter, hustling around NYC all day, it certainly felt like a refuge as well. It was beautiful, fairly quiet, and not completely humming with activity. Since then the word refuge has stuck with me, and since I am a Mom, specifically the question, “am I making my HOME a refuge?” I sure hope the answer is yes. You see, we don’t exactly live in a war zone or anything like that. It may seem like quite the opposite, as we live amongst rural, beautiful farmland in a relatively conservative area. However, we aren’t locked up in our own little world all the time. I have a husband who dutifully goes to work every day, providing for our family. My kids all attend public school, plus are involved in other activities. I work part-time, plus attend to the myriad of details that come with running a household of 7. We certainly don’t live in a bubble. Here’s why I hope my home is a refuge. The world out there can be tough–for the grown-ups as well as the kids. They need somewhere, after a long day at work or at school, to feel like they can rest, be refreshed, be loved, and not feel bombarded by the world. As my kids keep getting older (funny how that happens, eh?) I see the need for them to have a refuge more than ever. I can’t tell you how many times I’ve heard one of them say after coming in from school, “Oh, I’m so glad to be home!” Or I’ve heard my husband say, “It’s so good to be home.” This is why I’ve made it a point to be home when my older guys get home. Some of the best and most open dialogues we have had is that first hour after school. This is why I try to have a nice cooked meal (and a hug) awaiting my man when he gets home from work. This is why I try to keep things at least semi-organized and not chaotic feeling. There’s enough chaos out in the world, they don’t need it at home too. Sure, our house is no showpiece. It won’t be on the cover of Better Homes & Gardens any time soon, and that’s okay with me. My crew is comfortable here and they don’t feel like they live in a museum. My kitchen is not perfect, but it’s well used….like, all the time. I’m not serving up gourmet fare, but no one goes hungry and they all seem to enjoy my meals. We’re not always wearing the trendiest outfits and my kids might wear the same three shirts all season long (their choice), but the laundry is kept after and we’re not in debt paying for superficial things we can’t afford. We’re not perfect parents, or even the perfect husband & wife, but we try our best and try to honor God in what we do. It’s important to me that each child feels unconditionally loved, secure, and refreshed by coming home. Same goes for my husband. My greatest role is still as a Mom and a wife to these precious ones, even though they aren’t exactly little anymore. Am I making my home a refuge? I hope so. And I hope yours is too. I think it’s fascinating how so very different each family is. Their traditions, their way of operating, and just the way they roll. It really got me thinking about how our family does life, how WE roll. Our family is not perfect. No family is. We have numerous flaws, oddities, and times we have to pick ourselves up, dust ourselves off, and vow to do better. We’re all different….and that’s a good thing, isn’t it? God is the center of our home. Everything revolves around that—our marriage, our parenting, everything else. We say please and thank you. Even Mom and Dad do this, even with something as insignificant as passing the salt. Manners are important and show respect. Family dinner is a high priority, and we always pray before we eat together. It’s just not the same when we all have to grab something and rush out the door, or when someone is missing. This is where we share about our day, the highs and lows, and just hang out for a time. We expect good behavior. I am not a yeller–never have been, probably never will be. And no, I wasn’t really into “time outs” when the kids were little. There may have been an occasional swat on the backside when deliberate misbehavior happened. My kids aren’t angels, but they certainly aren’t brats either. I have no explanation for this, other than that they are just expected to behave! We love to read. Yes, all 7 of us. There is no secret technique or formula that we used when our kids were little, except that we read to them a lot and they saw us reading for pleasure. It caught on, and it warms my heart to see them all devouring books. We try not to overschedule ourselves. This is such a balancing act once everyone gets to a certain age, and right now we’re in the thick of it. Each child is in at least one activity. However, we are deliberate about not being too busy and will say “no thanks” to things that will make for an overly hectic week. We have a minimum of technology in our house. Seven people, one laptop. No personal Ipads, Ipods, tablets or anything. (Our oldest did get a very basic cell phone for his 15th birthday.) They ask before they use the computer, and if playing games on it, a timer is usually set. We try not to be materialistic. We have learned to live on one income, and live well on it. Secondhand clothes are just fine by us, as well as older vehicles and a not-big house. Christmas and birthdays usually are simple. Things aren’t too important, but people are. We serve others as best as we can. My husband is the prime example for this and is literally one of the most selfless people I’ve ever known. My parents are also great examples of this. I have become better at this as an adult (I think), but there’s always room for improvement. It is a joy to serve together, especially when it’s something the whole family can do. Vacation and time away together is important to us. No, they are usually not fancy affairs, but that’s okay. We shoot for one week in the summer, just us, away from all of our usual stresses and things that pull for our attention. We’re not into overly crowded, “touristy” places. Give us a cabin in the middle of the woods somewhere and we are usually happy campers. We are foodies. Kind of. My husband and I entered marriage in a unique situation—that is, we both knew how to cook. I do the majority of cooking during the week as I am the “at home” parent, and he does some meals on the weekends. We don’t eat out a whole lot as it gets wicked expensive for 7 people! Plus homemade is healthier. We have taught each kid various cooking skills, so hopefully they know how to fend for themselves once they grow up. As I’ve said before, to their future spouses: You’re Welcome. We try to be real. It’s interesting that my oldest, now in high school, is so very perceptive of “fake” people. I can’t stand it either, and hopefully I never come across that way. (You have permission to call me out on it if I do! Or slap me.) Like I said earlier, we are real. We are flawed. We are human. Well folks, that’s how we do life around here. Each family has their own ways, and that’s cool. So now if you suspected that we were weird before, you got your confirmation by reading this! This summer I fell in love. Not with a person, but with a place. Our family was finally able to visit Maine, and specifically Acadia National Park. It was something that had been on our bucket list for some time, but we decided to just go for it this year. I’m so glad we did! First up is the little property we rented. I have had tremendous luck with the VRBO website and found an absolute beauty of a cottage for us. We walked in, looked around, and declared it perfect for our family. This is the pond in back of the cottage, where we could sit and read or just relax. I have to say that the location of this place was wonderful—well away from Bar Harbor and crowds, on the very quiet side of the island. Our first full day there we set out to see the Bass Harbor Lighthouse. To get a great view of it, you need to climb down some steps and make your way over on giant boulders that sit along the shore everywhere. This is a view looking out the other direction. This trip was my first experience with this type of coastline, and I loved it. Our favorite place to visit was a place called Wonderland. There is an easy trail that leads out to this coastal area that has lots of tide pools. We ended up visiting there a couple of times during our week at Maine. Lots of cool little discoveries at this place and we spent hours there. Truly it was a “Wonderland” for my kids. The next day we did a tour of the main part of Acadia. We drove the Park Loop road, which I highly recommend. There are many places to pull over and park along the way. We parked at the Otter Point area and hiked the Ocean Path a couple miles up to Thunder Hole. Along the way were the Otter Cliffs, as well as many other scenic views. At many points you could go out to the edge, whether it be high up or down along the water. We also drove up Cadillac Mountain, where you could see out far in all directions. That evening we attended a lumberjack show, which was both educational and entertaining! Our family usually enjoys the lesser-known spots and trails. Fortunately for us, we were on the side of the island away from the main crowded areas. It was still full of beautiful things to see and do! Above is a picture from serene Pretty Marsh Harbor. I regret that I have no decent pictures from our whale watching excursion. (Those whales are just too darn fast for me!) This was an incredible experience! We saw many different whales and were VERY fortunate to see them in various stages of feeding. Lots of tail flukes, some full rolls, and one that did about a full breach for its rapt audience! Upon pulling back into the harbor, our guide was wowed and said that was the best trip they had all summer! An unforgettable experience for all. One morning we visited the Oceanarium, which boasts a lobster hatchery and museum, among other things. At first glance it appears a little run down and ramshackle, but we had a good experience there and learned so much. The guides really took a lot of time to explain things to the kids. Another morning we took the gang and hiked up a mountain. Parkman Mountain was one of the neatest hikes I’ve ever done. Though it’s not as well known as Precipice or the Beehive, it was really cool and worth the climb. (And yes, now I can say that I’ve done one with rungs built into the rocks to actually help climb up…it was just in one spot, but whatever. Bragging rights, y’all.) My husband was taken with all of the old cairns that marked some of the original trails. We saw cairns just about everywhere. It was a great experience to conquer a mountain as a family. We had a picnic lunch at the summit to celebrate. On our very last full day in Maine we hiked around Jordan Pond (which to me was more like a lake…). Part of it was on little boardwalks, as seen above. The water that day was a gorgeous blue–my pictures do it no justice. Some other places we visited were Echo Lake Beach, and my oldest and his Dad hiked Beech Mountain and the Beech Cliffs and said they were awesome. Seriously, I very much fell in love with Maine and Acadia. It suited us so well and was one of our best vacations ever. If I didn’t love our little piece of Lancaster County so much, I would be very tempted to move!! Hope you enjoyed my photos. There will be smells. Notice that this is at the top of the list? For years our bedroom (the main baby changing area) was all Eau de Diaper Pail. Alas, it is finally stink free, but the odors have shifted to other areas. My boys’ bedroom, for example? Imagine a locker room aroma all the time. Can’t get rid of it. And just wait until your precious one suddenly develops BO. Shocker for the senses, y’all. My 12 year old, who is really good about wearing deodorant regular, forgot to put it on for about a week just recently. It must have slipped his adolescent mind to also WASH under his pits while showering. It was bad, friends. So bad that his Dad even noticed and ordered him to scrub one night after driving him home from an outing. Start stocking up on Febreze and deodorant now. You may scoff but I’m serious. You will become a taxi driver/chauffer. I hope you like your current ride because as soon as your kids are in ANY activities you and your vehicle will be like one. Sad but true. Even if you limit their extracurricular activities (we do), if you have multiple children you will find yourself driving—a LOT. You can sometimes grocery shop all by yourself. This is a definite perk! At first this may seem like a vacation. Then you get kind of used to it. I think it took me a solid 2 years before I stopped shifting the cart back and forth whenever I stopped to look at an item. I was so used to keeping a little one calm while shopping that the movement was like muscle memory. Now I actually sorta like taking an older one with me so they can help me carry everything in the house! Speaking of grocery shopping, you will be doing it OFTEN. No joke. Even up until a couple of years ago I could do a main grocery haul every few weeks and just do a fill-in here and there. I even did a little series about once a month grocery shopping. There’s no stinking way that could happen now!! It’s ridiculous how much can disappear in a few short days, especially once you have a teenager or two. A couple of days ago we had a big cooked lunch where everyone had plenty. Maybe an hour later I heard a package crinkling in the kitchen. There stood my 14 year old with a giant gross sandwich made of multiple Pop Tarts and an inch thick of peanut butter in between. He shrugged his shoulders, gave me a sheepish grin, and stated that he was hungry. There’s lots of crap to keep track of. BIG one here, my friends. Once anyone is in school it begins. You’d better have a good paper-keeping and calendar system in place now or it could go south quick. Lots of papers to keep/toss, reading logs to sign, homework stuff, permission slips, fundraiser crap, snack sign-ups, and the list goes on forever….There’s been many a time that I’ve accidentally thrown a paper away and ended up digging through trash to locate it for a crying child. On the scheduling note, once upon a time my life revolved around preschool days and naptime. Now? Not so much, but just about a gazillion other things to juggle and generally keep track of in a day’s and weeks’ time. Moms, you will still be busy, just a different kind of busy. Though having lots of littles was all consuming, I feel like life was generally simpler than it is now. The laundry increases. Sure, you may not be washing multiple baby outfits and nappies or whatever, but here’s the truth…..the clothes get BIGGER and therefore take up a lot more laundry space. The clothes get closer to adult sizes and therefore you just have generally more laundry mass and volume to keep under control. I know that for sports Moms the whole uniform thing can be a pain. You can play more games together. A fun plus as they get older! We honestly didn’t do a ton of board games until recent years because now they can all understand rules and play on their own without Mom or Dad having to supervise. 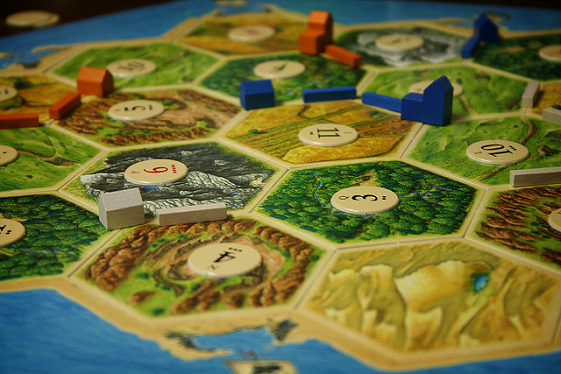 My youngest guys just turned 9 and we bought them Settlers of Catan. (Some of the best money ever spent!) We’ve had a blast learning it and were quickly and oh-so-nerdily addicted!! It’s been too fun just being engaged together in this way. They get more adult humor. I’m not talking raunchy or anything like that. Just more grown-up humor in general. One evening my oldest just “had” to show me something online and we ended up looking at and cracking up over pictures of Pinterest fails. He also comes up with the greatest one-liners that are so witty. You get to watch them blossom. I am getting more and more glimpses of the adults these guys will become and it’s pretty awesome! I love seeing the personality differences and watching their individual interests and talents come alive. So I’m sure there’s more that can be added to this list, but those are some of the high points for me. I loved having a house full of littles and all the wonderful things that came with that. Looking back I do believe we enjoyed that stage very much, and I’m glad we did. However, there are so many neat things about each and every stage that a parent can enjoy. Welcome to the most “blah” month of the year! Yay! Vaseline Rosy Lips. I love lip balms and glosses that work, and ones that are slightly tinted are just my cup of tea. This one in a cute tiny tub from Vaseline has been in my purse all winter and I really like it. Rock the Park. This is a recently added show on Netflix that we discovered. It’s very family friendly and follows a pair of young guys as they explore the National Parks one by one. We’ve only watched a few episodes so far but have learned lots. Speaking of National Parks, we have planned for a week-long summer vacation at Acadia National Park in Maine! I am super excited for this as it looks spectacular. If anyone has suggestions for things to do in that vicinity, let me know. This will be our first time there. The crock pot. I typically don’t use it as much as I should, but lately I have. So handy! My Side of the Mountain. Another recent addition on Netflix. Most of my kids have read the book, so it was nice to watch the movie version. (Except we had tears from one son when Frightful gets shot in the movie and doesn’t get back up.) Otherwise we all thought it was good.